Pics and Kicks: We Have a Winner! Nearly 450 entries later we have a winner of our Wicked Stitch Designs camera bag giveaway this week! Thank you so much to all who entered! Drum roll . . . .
Chrystal will receive her choice between 3 camera bag designs: Milly, Knox, or Meridian. She also gets to select her own fabric at eQuilter.com (anything $10/yrd or under is fair game)!! Chrystal, shoot me an email and we'll get you in touch with Alida so you can get your bag STAT. Stay tuned for next week's fun giveaway! Have a fun and safe weekend all y'all! PS. 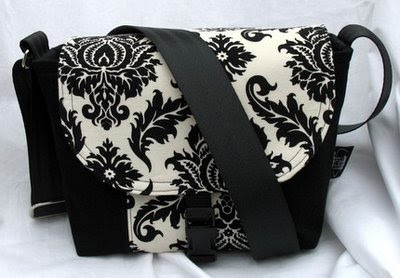 be sure to check out Wicked Stitch Design's new Messenger Bag which is in the works. I saw it on the Wicked Stitch Design blog today and I love it!